Some view points are so widely used that they are called standard. The isometric view point, corresponding to equal 120° angles between any two world frame axes, is one example. In Mechanics Explorer, you can select such view points by clicking the standard view buttons. 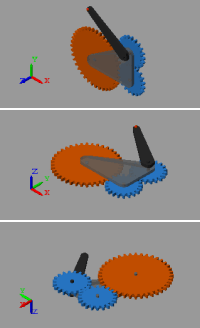 The figure shows a Cardan gear model from the different view points using a Z up (XY Top) view convention. 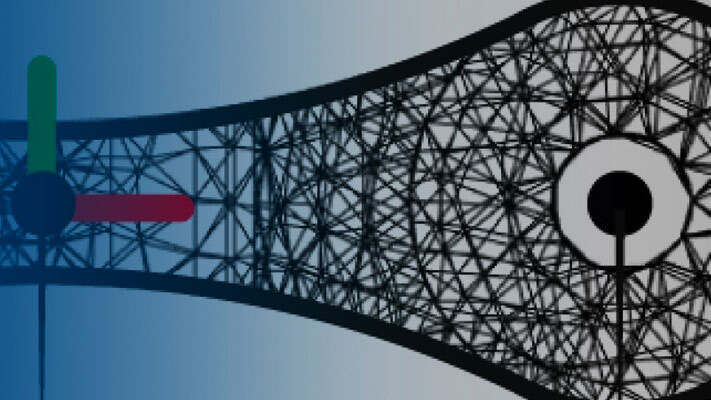 The figure shows a Cardan gear model from an isometric perspective using the three view conventions: Y up, Z up, and Z down. In the Mechanics Explorer tool strip, set View convention to one of the three options. Select a standard view button. The new view convention takes effect the moment you select a standard view. — Rotate the camera about a general 3-D axis. — Roll the camera about its current aim axis. — Pan the camera in the current visualization plane. — Increase or decrease the camera zoom level. — Change the camera zoom to show only the selected region. You can also use keyboard-and-mouse shortcuts. The table summarizes the available shortcuts. Click and hold the mouse scroll wheel. 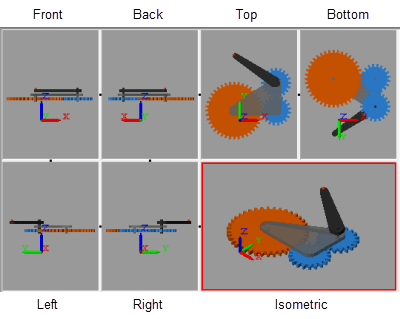 Move the mouse in the direction you want to rotate the model. Move the mouse in the direction you want to pan the model. Move the mouse up to zoom in, down to zoom out. You can view your model from different perspectives, for example, to examine its motion in different planes. So that you can compare different model views, Mechanics Explorer enables you to split the visualization pane into tiles, each with its own view. To split the screen, you use the Mechanics Explorer toolstrip buttons shown in the figure. Split the model view into four equally sized tiles, each with a different view point (front, right, top, and isometric views). Merge all tiles into a single pane with the view point of the last highlighted tile. Split a visualization tile vertically or horizontally into two equally sized tiles. 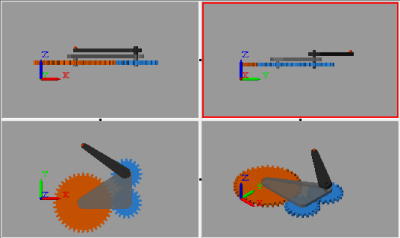 The figure shows the Cardan gear model with a four-way visualization split. You can merge two tiles by clicking the black dot between the tiles. To ensure that the resulting tile uses the view point of one or the other tile, select that tile first before clicking the black dot between the tiles.